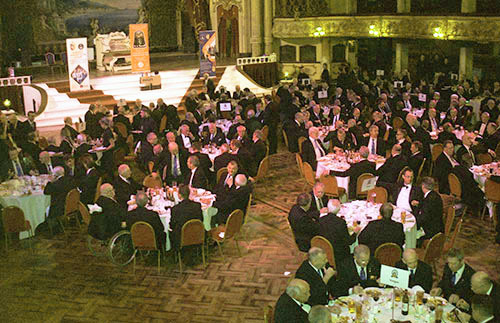 The world famous Tower Ballroom in Blackpool was the venue for the consecration of a military craft lodge, Pro Patria Lodge No 9952, attended by the Provincial Grand Master Tony Harrison and accompanied by many Assistant Provincial Grand Masters and many distinguished Provincial grand officers. In total there were 350 brethren present at the consecration of the lodge and the subsequent installation of founding master of the lodge Bob Wareham. Provincial Grand Master Tony Harrison and Bob Wareham, the master of Pro Patria Lodge. The afternoon began with the founding brethren assembling in the lodge room. Assistant Provincial Grand Master Harry Cox entered the room in procession and took the chair. He invited South Fylde Group Chairman Ian Ward to be senior warden, North Fylde Group Chairman Duncan Smith to be junior warden, Blackpool Group Chairman John Turpin to be immediate past master and vice chairman of the Blackpool Group David Cook to be inner guard. Harry then proceeded to open the lodge in all three degrees. Continuing the ceremony, Provincial Grand Master Tony Harrison, accompanied by numerous acting Provincial grand officers, entered in procession and Tony took the chair. He appointed his officers pro tem. Tony addressed the brethren on the motive of the meeting and called upon the Provincial Grand Chaplain Godfrey Hirst to give the opening prayer. This was followed by a magnificent ceremony of consecration, dedication and constitution of the new lodge, with the Provincial Grand Master taking centre stage, ably assisted by Godfrey Hirst. The founding members of Pro Patria Lodge. The Deputy Provincial Grand Master Philip Gunning was then invited to take the chair for the purposes of installation. In turn he invited Provincial Senior Grand Warden David Asbridge to act as installing senior warden, Past Provincial Junior Grand Warden Jonathan Heaton to act as installing junior warden and David Cook to remain as installing inner guard. Master elect Bob Wareham was presented by his good friend Roger O’Loughlin and was installed in fine style by Philip Gunning. The working tools were presented the short way in turn by Mark Barton, Barry Fitzgerald and Ian Halsall, all of whom are Provincial Deputy Grand Directors of Ceremonies. Following the presentations, Tony Harrison had great pleasure in presenting the new warrant of the lodge to the newly-installed master. Philip Gunning then presented a brand new book of constitutions. The brethren enjoying the festive board in the Tower Ballroom. The address to the new master was deftly delivered by Ron Strangwick and the officers of the lodge were invested. There were several addresses on such a grand occasion, namely to the wardens by Jonathan Heaton, to the chaplain by Godfrey Hirst, to the secretary by Provincial Grand Secretary Peter Taylor, to the director of ceremonies by Provincial Grand Director of Ceremonies Keith Kemp, to the charity steward by Duncan Smith, to the deacons by Peter Rumley, to the stewards by Phil Burrow and finally to the brethren by Harry Cox. At the conclusion of the installation, Tony Harrison tendered his congratulations and wished the lodge every success for the future. The brethren were then treated to a wonderful festive board and responses to toasts were given by Philip Gunning, Tony Harrison and Harry Cox, in their usual erudite manner. The master’s song was uniquely rendered by three brethren, Roger Lloyd Jones, Peter Baldwin and Mark Rae. In response, the newly-made master Bob Wareham thanked the founding brethren for all their help and also the Provincial Grand Master and all the Provincial team. 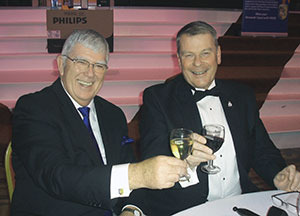 At the conclusion of a marvellous evening the tyler’s toast was delivered by the Provincial Grand Tyler Peter Maxwell. Distinguished brethren with the Provincial team.